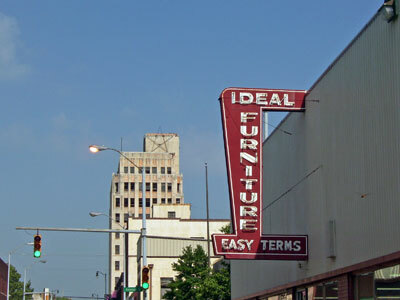 Ideal Furniture first opened as a drug store for residents in the Ensley community in the 1920s. In the near future I’ll post a picture taken during the early days of the business. The business now services many customers throughout the metro Birmingham area providing furniture that comes delivered to your home assembled for you and not in a box. It also serves as a symbol of longevity in the Ensley community and as a sign that hope springs eternal there. Based on the earlier image, it would be safe to say that the sign, one of two neon signs installed on the building, was installed after 1930. It is poised to benefit from the development of new homes in the area, including the HOPE VI project rising from the rubble of the former Tuxedo Court housing project. Another landmark building in the district, the Ramsay McCormack Building stands in the background of the picture, dominating the skyline of the area. Hopefully one day we may see the signage relit, adding to the character of the district. Click here to view the home page for the series and here to view the photo gallery. Don’t forget to click on the badge in the sidebar to learn more about Tuesday’s Happy Hour event! Or just click here to view a description as posted on Upcoming.org.